Wondering why use Form Builders ??? You are hosting an e-commerce website. That’s cool! Your website stands goodwill over the web. Even better! But when it comes to getting in touch with the target audience, some sort of medium is required. If you look around the web-world, you’ll realize all the websites consist of a ‘Contact Us’ page. 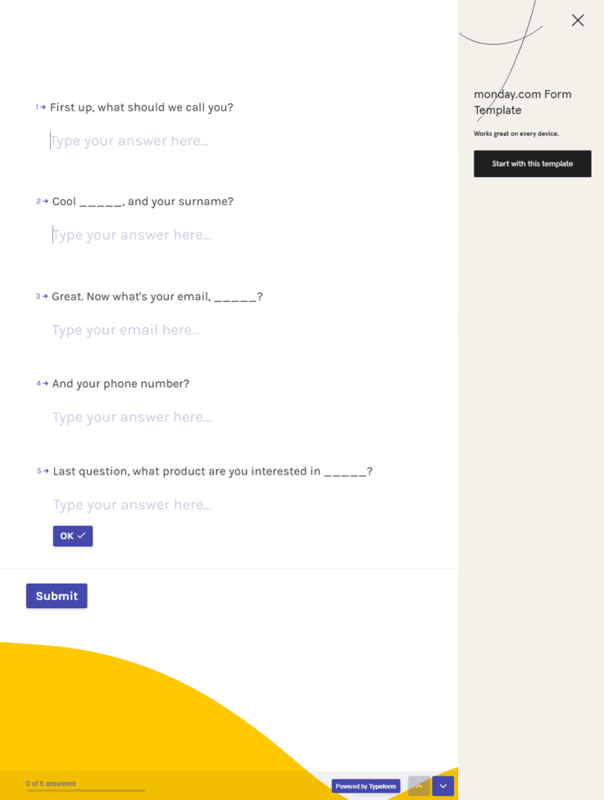 This page beholds the contact form that helps the users to connect with the users. See, here comes the need for Forms. Further, there are several other uses of forms as well. You want to be sure that customers are satisfied. Lead Generation Forms are your saviour! Or, how to collect payment? Payment Collection Forms to your rescue! Now that you know the importance of ‘Forms’, you might be wanting to know about the form builder software. Right? Offline- You gotta download & install an application on your website. And then, you can create forms without any hassle. Online- There various SaaS-based applications i.e. 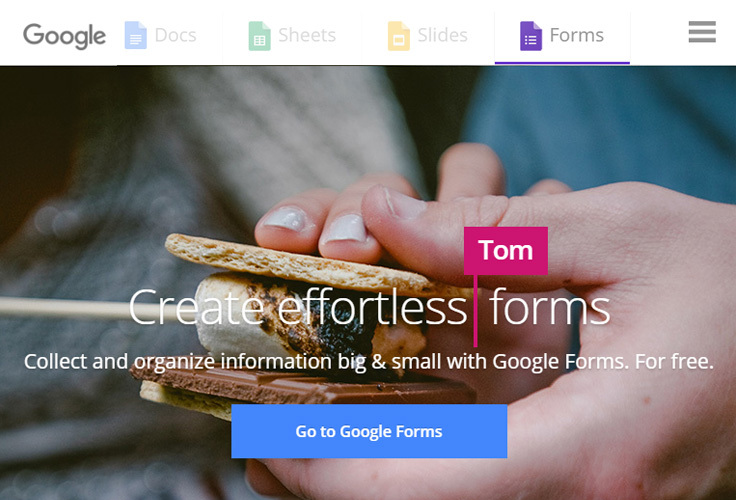 form builder tools that you can subscribe & start creating forms. Besides, you don’t even need to install any app that will consume space on your disk. So, we are going to about the Online Form Builders that will help you to insert & validate the desired fields and embed them on your websites, social networks and anywhere else. Apart from this, there are myriad of form builder tools available in the market. And it’s really difficult to choose the best one. 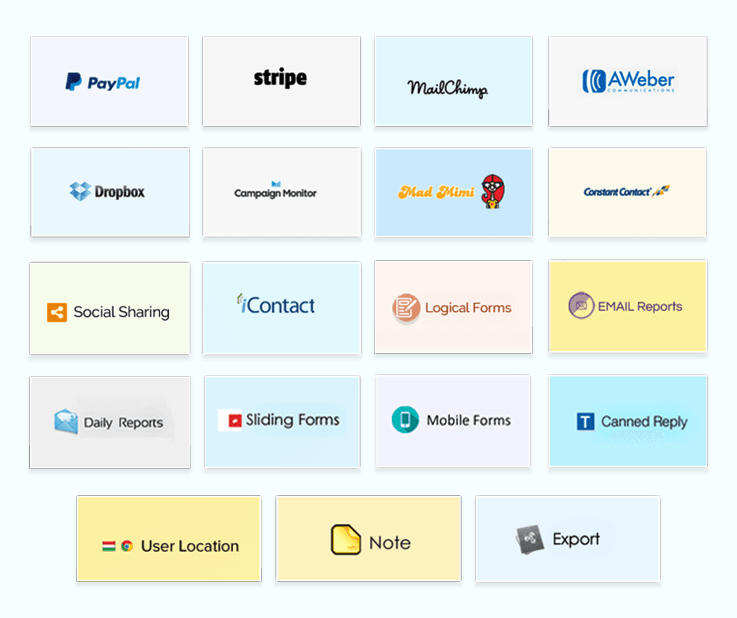 While, some of the form creator software offers easy UI, drag & drop builder, etc others provide reports, hassle-free payment collections and much more. 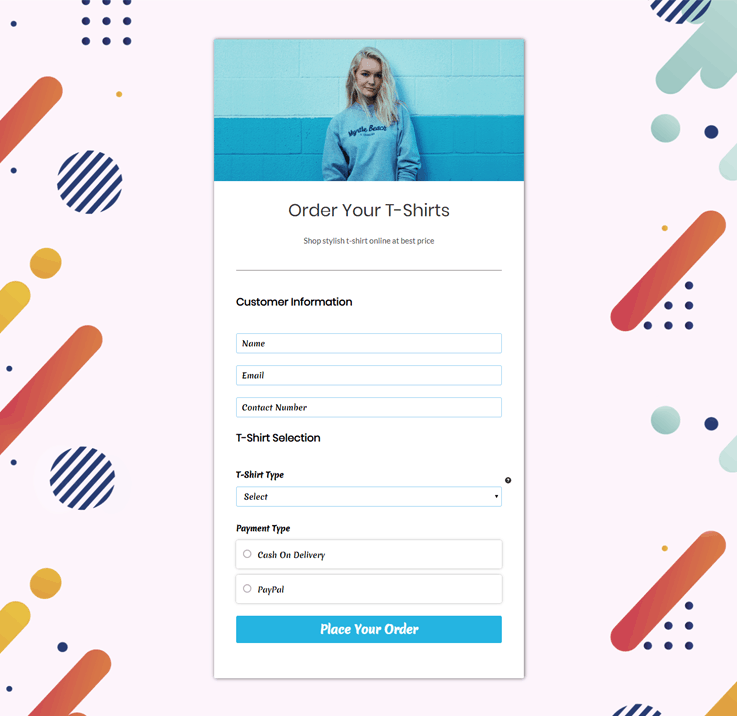 In this article, we are going to highlight some of the best online form builders along with their pricing details and key features that will help you to find out the one that perfectly meets your business requirement. FormGet has got every basic to the advanced features which a form builder of 2019 should have with the most user-friendly approach! It’s isn’t any plain drag and drop builder but it surprises you with smart block editors, numerous beautiful themes, a lot of pre-built form templates and more. So, with this form builder, you can possibly create anything right from registration forms, payment forms, polls, quizzes, questionnaires and a lot more! Undoubtedly, it lets you create an ultimate responsive and sorted form along with smart features like unlimited fields, conditional logics, conditional redirects and more which adds the real worth. You can collect payment using both PayPal and Stripe with ease. Also, it empowers you to collect recurring payments as well. So, payments collection get smarter than ever with FormGet. With FormGet, you can highlight the product quantities, product images, and can collect payments for more than one products at the same time. Then, it lets you used all the multimedia stuff in the form. So, right from videos to images, you can use it all. Also, it’s upload feature lets you collect the files of almost every format by the user be it a PDF, JPEG or even docx. With FormGet, you can seamlessly share the form by freely embedding it to any website or can share it on the social media networks too! You can create a custom submission page for the users after the successful submission of forms. However, FormGet provides a default “thank you” message and page which you can customize. Hidden fields is one of the most interesting features of FormGet which allows you to create the fields which only you can see. So, this way, you can easily sort different forms by using the hidden fields. How the form will look like? Free Plan – You can try FormGet for absolutely $0! Yes, it offers a trial plan with unlimited benefits of FormGet. So, create unlimited forms, collect unlimited leads and a lot more! Beginner Plan: Just $5/M is all it takes to start with the premium subscription of FormGet. In this plan, you can create unlimited forms, collect payments, track the analytics, use autoresponders, get email notifications and a lot more! Rookie Plan: $35/M of this plan will provide you the access to all the basic and advanced features of FormGet like unlimited form creation, seamless sharing via embedding, canned replies, up to 2GB of storage, integration to Dropbox accounts and a lot more along with 5 payment accounts. Pro Plan: At just $79/M, you get almost every feature of FormGet including 15+ payment accounts, 7GB+ storage, along with priority support and agents clients dashboard. Advance Plan: Just $99/M, you get the access to unlimited users, unlimited submissions, unlimited payment accounts, form embedding to unlimited domains, up to 10 GB of storage along with top priority support, form scheduling and a lot, lot more! Pabbly Forms win hands-down when it comes to the cheapest and most effective form builders. Using Pabbly Forms, you can create any kind of forms in a blink of an eye using drag and drop builder. Also, you can further enhance your created form with the in-built conditional logic. Now, the forms you’ve created can also be integrated with various payment gateways like PayPal and Stripe. So, you can collect payments hassle-free. With this, you get some really impressive features like submission reports through email, autoresponder, canned replies and the list goes on. 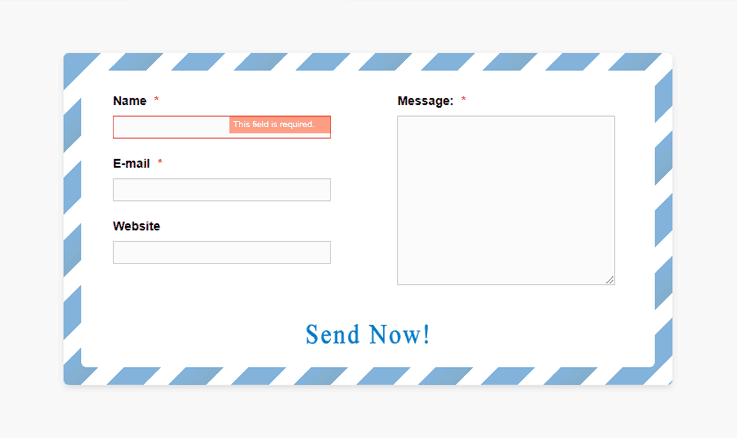 It offers you a fresh breeze sliding and pop-up forms which you can create using drag and drop builder. To offer security against spammers and bots, the forms come with the feature of ReCaptcha. Then, it provides data security using data encryptions and provides secure payments with SSL encryption. You can schedule when to take forms on air and when to take them off air using form scheduling feature. There’s also an option to add media files like images, videos to your forms. You can convert any longer forms into a shorter one using conditional logic and branching and creating dynamic forms. Pabbly Forms has got 4 distinctive pricing plans. These all are extremely affordable and the cheapest in the web market. Starters Plan – This plan has a price range of $5 per month. In this $5, you get 1 form, 1 user, 1200 submissions along with 1 payment account. Apart from these, you get an array of features like multilingual forms, SSL encryption, ReCaptcha, 3rd party integrations and a lot more. Rookie Plan – It costs you $35 per month. In this plan, you get 5 forms, 25 users, 25K Submissions along with 5 payment account. Along with these, you get an autoresponder, custom message, social sharing with social sharing icons and a lot more. Pro Plan – This plan costs $79 per month. You get features like unlimited forms, 10 users, 60k submissions along with 15 payment account. With this plan, you’ll also get Google Analytics Integration, Dropbox account integration, multiple currencies, with 260+ free templates and a lot more. Advance Plan – It costs you $99 per month. This form gives you everything in unlimited like forms, payment accounts, users, submissions and a lot more. This also gives you priority support along with live chat support and more. Google has almost taken over all our works and functions. With Google Docs, it provides an excellent alternative to the Microsoft Word. It also serves as a tool for form development with its inbuilt feature of Google Forms. The biggest advantage of using the Google Docs is its familiarity for the users as well as the storage space it allows on the system. The Google Forms are free. No charges are applied for the use of these forms. The form creating procedure is faster as compared to the other apps with Google Forms. Further processing of data is possible using the excel files of the Google Docs. Google actually can provide the quick graphs and analytics for the forms instantly. These forms can be edited by the team just like Google Docs. Google Forms stands out when it comes to tracking and analysis. It provides you with real-time reports about the forms in the graphical format. Google Forms Pricing: Free of cost. The biggest limitation of Google Docs is that there are no customization options. 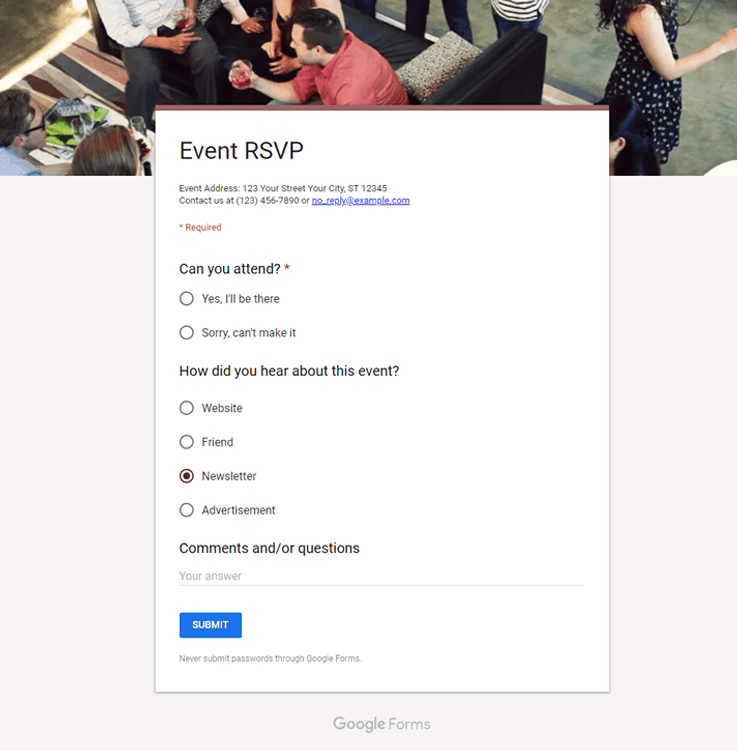 The Google Forms comes with standard format, and the same can only be used. With the Google Docs, only basic form fields available. No frills like payment option, customization of the output can be added to Google Docs. 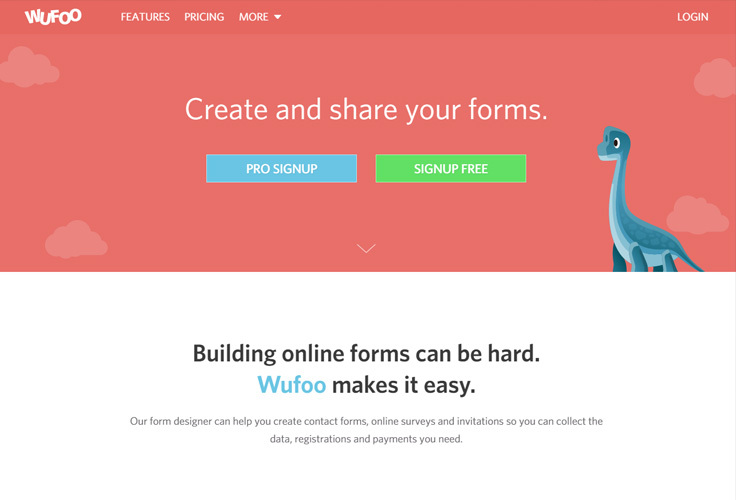 Wufoo as a form builder provides the look as well as the features in the form. It allows anything to be added to the form including the payment options as well as the file uploader. It has been there for a long time, and it is possible that you have already heard of it. This easy to use form builder with strong reporting skills is perfect for beginners as well as for the seasoned users. 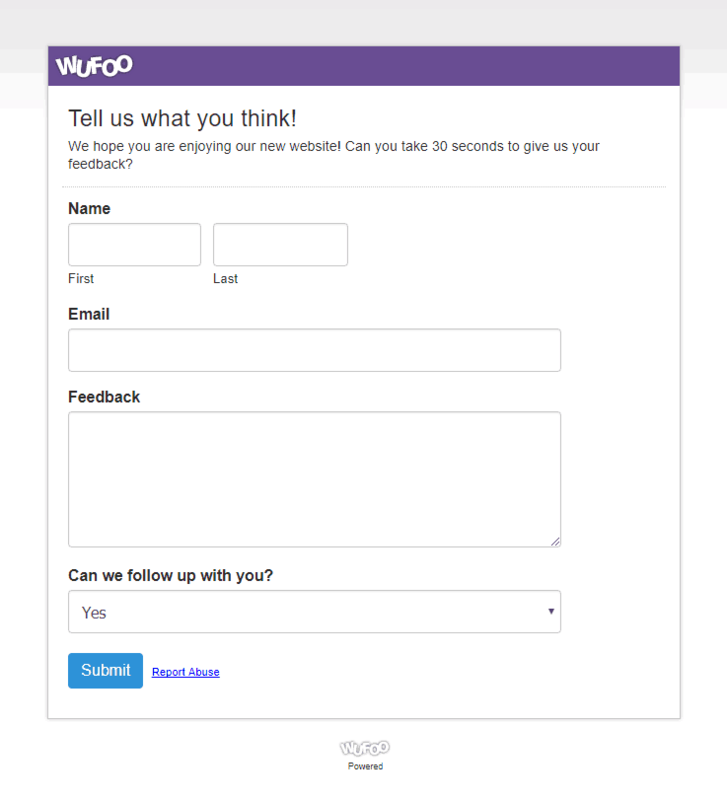 Wufoo offers strong form analytic feature which allows the user analyze the number of visits to the form and how the form was utilized by the viewers. It comes with intuitive Drag and Drop features which allows the ease of form development. Logic branching options of Wufoo allows the logic to be developed so as to allow the viewers to skip the certain sets of questions. This software offers payment integration services to the users through PayPal. Also, with Wufoo, it is possible to automatically save the data to Dropbox, Google Drive or any other synched option. Wufoo Pricing: Free for first three forms and 100 entries; $14.95/month for up to 10 forms and 500 entries; $29.95+/month after that. The forms cannot communicate with each other to develop the meaningful report and hence each of the forms needs to be studied independently. If one of the fields is deleted, all data collected prior to deletion is lost. This creates a concern when the form is to be archived. Wufoo has a fixed set of fields to select from and does not allow much in the form of customization of fields. Although the fields cover the majority of the sections, the users might have to search for some other form builder if they are looking for a specific field. If you’re looking for creating a professional form or want a form for the business purpose, there is no better form generator like Formstack . With its feature of denying submission, advanced payment processing, digital signature, encryption etc. 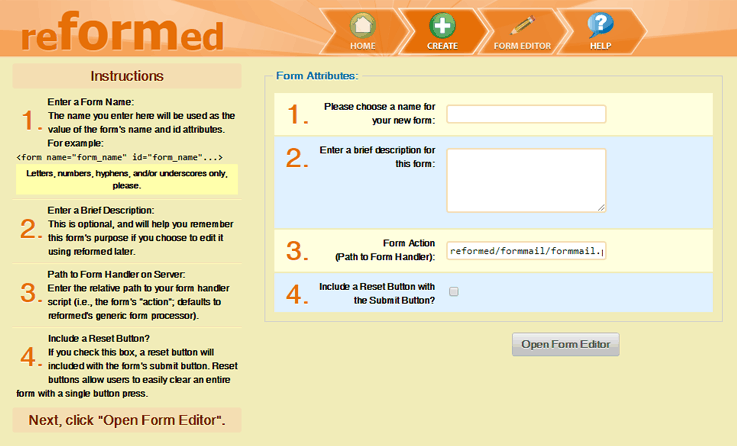 this form generator is preferred by all those who are looking for extra features in the form. While the other entire form app play in the basic form generation, Formstack takes the process a notch higher with its interesting and non-beatable features. Formstack has an intuitive interface that makes it easy to develop the forms. Formstack offers the ability to archive the form without the loss of data. This is a definite advantage over the Wufoo and other form builders. Formstack allows the forms empowers you to send attachments. 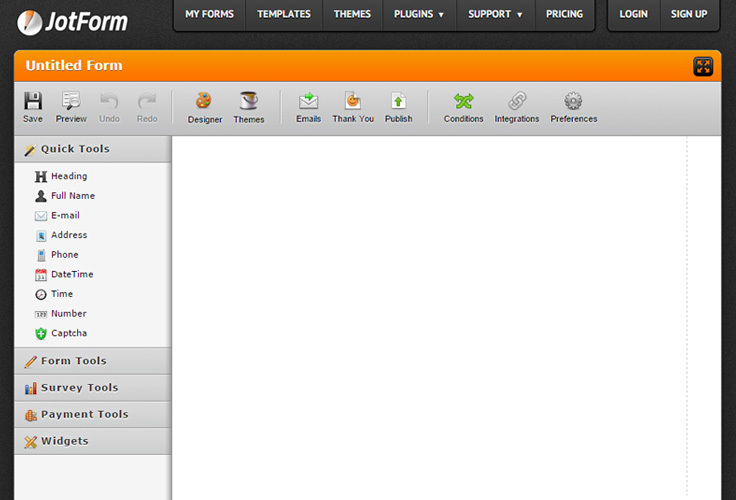 Comes in integration with the third parties like Twitter, Google Docs etc. possible while using Formstack . Live Chat for Customer Support is provided to solve all the users’ concerns. A tips and trick blog is available to the Formstack users which help the users stay ahead in the game. This tips and tricks blog helps the users in making their form more user friendly. Formstack provides an intuitive analytics dashboard for various site matrix such as revenue, cash balance, net income, profit margin etc. 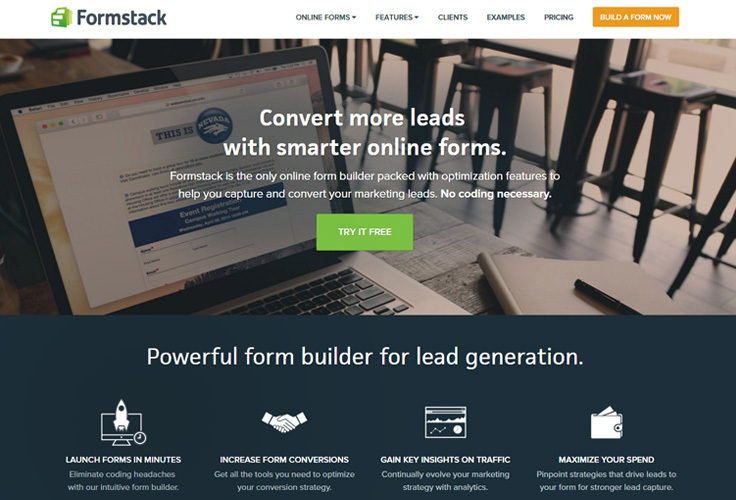 Formstack Pricing: Free usage for 3 forms; $14 for 5 form plan; 20 forms for $29 plan, $59/month for up to 100 forms and 2,000 entries; $99+/month after that. Free usage for 3 forms; $14 for 5 form plan; 20 forms for $29 plan, $59/month for up to 100forms and 2,000 entries; $99+/month after that. The biggest limitation is its comparatively higher price. The Formstack is priced higher than its counterparts. Limitations on all levels of membership are there, thus making the process a bit difficult for the users. Note – No video tutorials or phone support is available in Formstack. 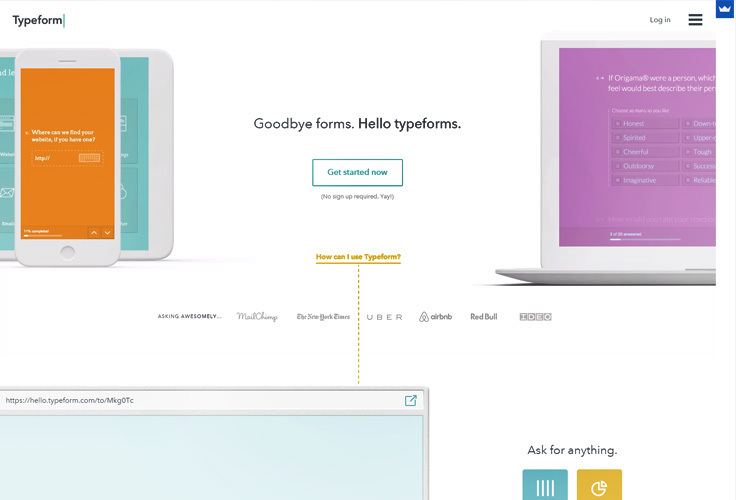 Typeform is a different kind of form generator. While all the other form generator shows the entire form in a single view, Typeform allows the users to defy the convention and work on one question at a time. This visually delightful form generator allows the user to attach the pictures and multimedia in the form itself. With Typeform, interesting and creative form creation is possible because of the freedom of the question and layout selection. Typeform allows free form creation possible with an unlimited number of responses. Huge numbers of templates are available which can be further modified to suit the requirement of the users. This software allows using images, videos, and multimedia in the form. 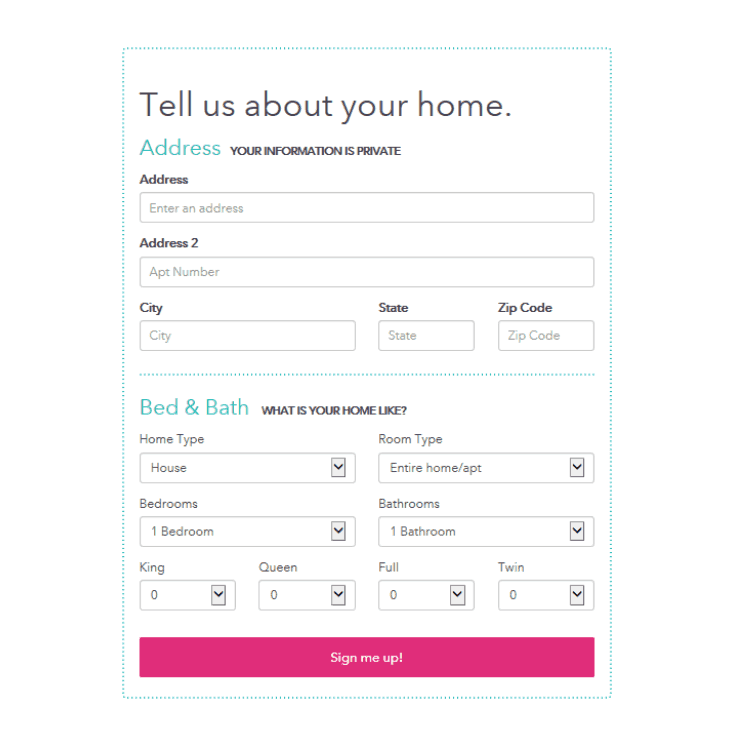 Typeform also allows the use of images as buttons in interactive forms. Payment integration is possible with Typeform. It supports the logic jumps and branching. Typeform Price: Free with core features; $20/month with pro features of logic jumps, payment etc. One of the limitations of Typeform is that there are limited options for analyzing the report. Unlike the above-indicated software, the Typeform does not provide a detailed analytic report. The second limitation is that its integration is only with the limited number of payment gateways, unlike the other similar form generators. Ninja Forms is a WordPress plug-in used for generation of forms on the WordPress blogs. This plug-in is available for free for a lifetime with basic version for unlimited forms with unlimited responses. Further features are available with the paid version. For the users using WordPress, the tool of Ninja Form is a real boon. Customizable Notifications for the response to the forms are available with Ninja forms. Ninja Forms provide an option of sorting, searching and downloading the entries through .CSV format. Customization of CSS and layout available with the paid version of Ninja forms. Ninja forms come with built in Akismet Protection to protect from the spam. Ninja Forms Pricing: Free for unlimited basic forms; add-on extensions from $19 and more each. 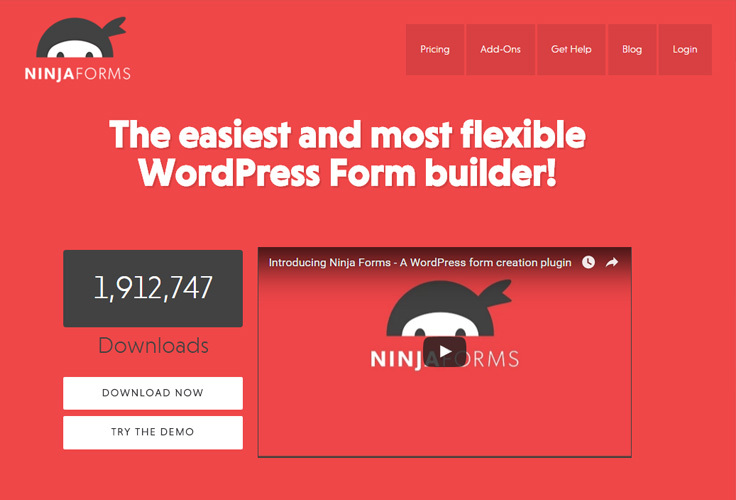 Ninja forms require a self-hosted WordPress site as this is practically a WordPress extension. Each extension of Ninja forms is priced at variable price with price ranging from $19 to $49. This can make the form far more expensive than its counterparts. FormAssembly is a simple form builder tool which helps in building form for an international audience with its wide language support. 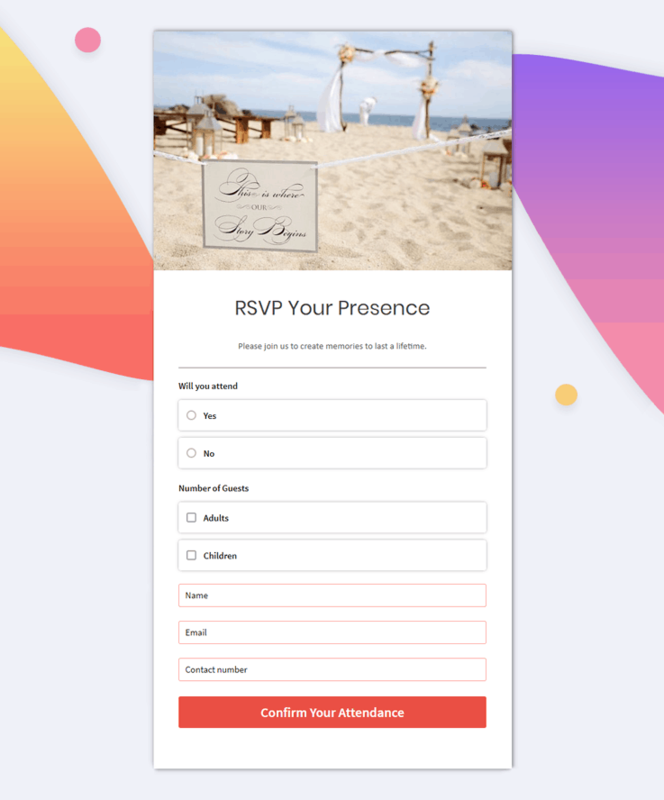 The biggest advantage of this form builder is that instead of plain drag and drop, it allow the users to customize the forms and form layout from the scratch. FormAssembly offers the translation in for more than 30 languages. FormAssembly can be utilized for as the WordPress plugin or as an independent form with its utilization capability. Pay-as-you-go feature in FormAssembly available for the websites which are not sure about the traffic. Form Scheduling and Calculated Fields Option is available in FormAssembly. FormAssembly offers unlimited number of forms for free users as well. It offers a guarantee against Spam, and does not count the spam responses. 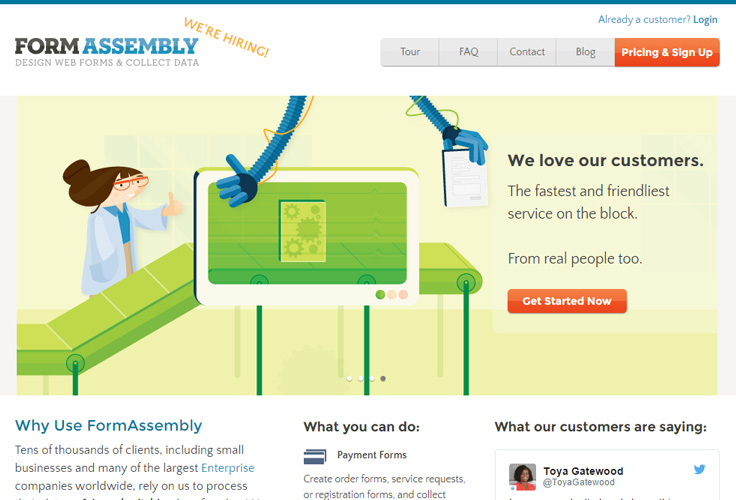 FormAssembly offers Excellent and strong online support. Payment Collection possible is possible directly through the form built using FormAssembly. FormAssembly Pricing: $28/month for basic features; from $59/month for API access and advanced integrations; from $250/month to run on your own server. FormAssembly does not accept the attachments. FormAssemby’s form does not allow inclusion of Captcha. 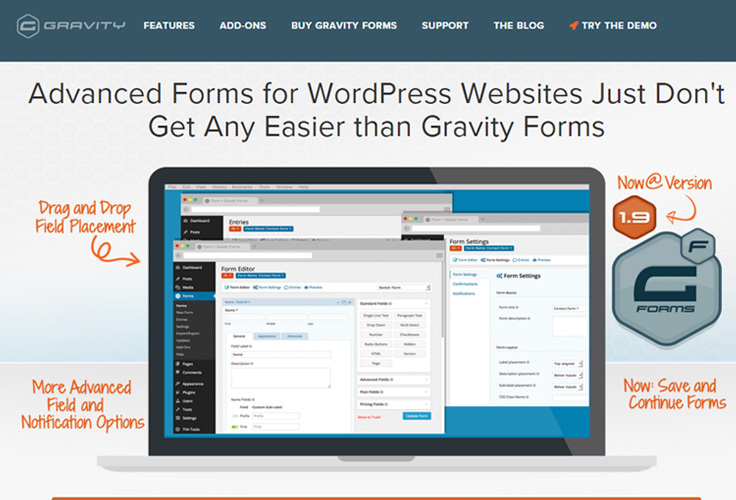 Gravity form is another plug-in for the WordPress which helps in building the form within a WordPress website. The biggest advantage of using Gravity forms is that these are theme-optimized forms, i.e. the forms embed themselves with the theme of the website seamlessly without any special programming by the users. Gravity forms offer ease of form development from within the website itself. Unlimited forms with no restriction on results can be generated using Gravity form. Gravity form offers attractive pricing with special re-sign discounts which makes them an attractive choice for the lower budget users. 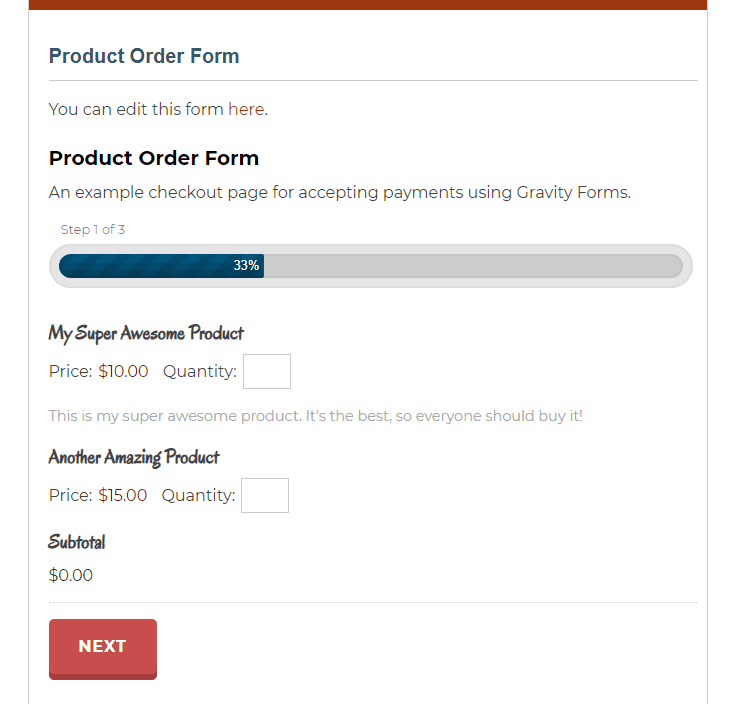 Gravity Forms Pricing: From $39 per site, with 1 year of upgrades and support. The biggest limitation of these forms is that it charges quite a high price to integrate the Ecommerce. This HTML5 based form builder tool is the best available tool to develop a form which looks like the part of the website itself. The biggest advantage of this form generator is that it is comparatively cheaper as compared to the rest of the form generators. Reformed offers ease to develop the form as per the choice of the user and theme requirement with the help of the HTML coding. It comes with instruction which suggests different features. This saves the list of forms created in past. Also, it supports via help of support documentation. 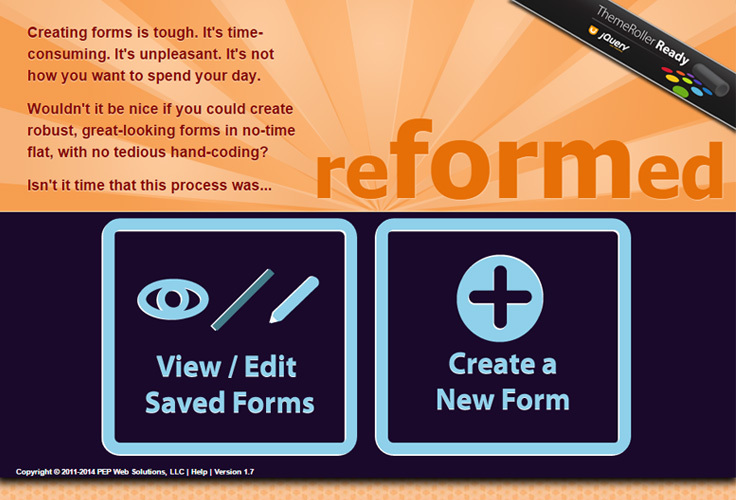 Reformed allows the saving of form directly in the web browser. Reformed Pricing: Free of Cost. The biggest limitation of this form generator is that it requires the knowledge of programming and hence is not suitable for the beginners. JotForm is one of the easiest, fastest full-featured form builders. It is possible to immediately start building up of forms on Jotform.com. The site does not ask for any sign-ups for the free user and the responses can be received by adding the email id in the end. The code generated while preparing the form then needs to be added to the website. This form maker is buzzing with multiple features and is one of the most famous form-builder preferred by the users. 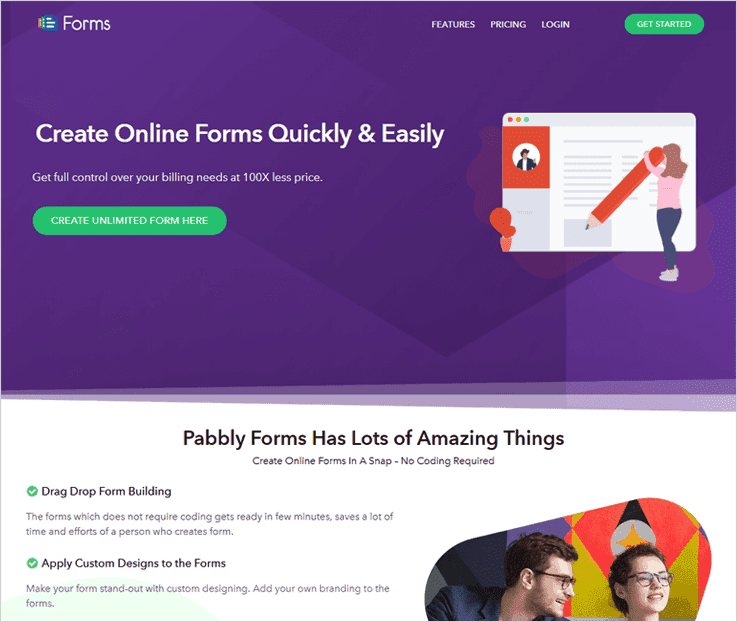 JotForm offers fully customizable form with more than 2500 templates and 40 themes. 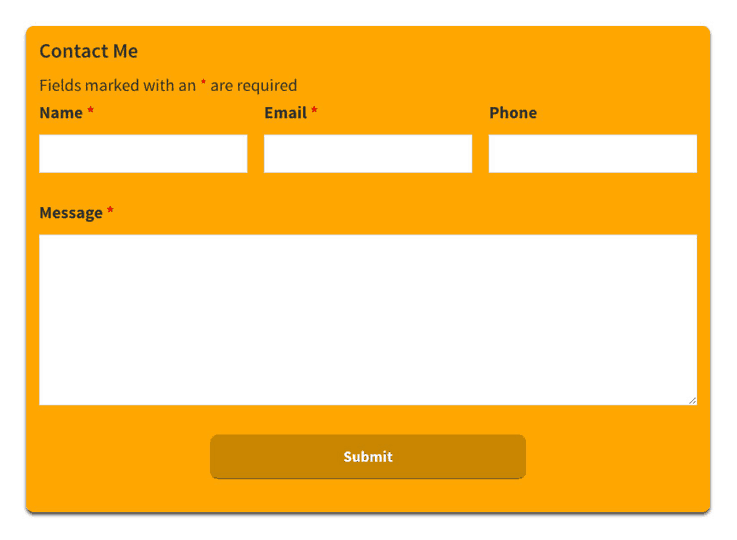 Customization of the form is quite easy with UI interface of JotForm. No registration needed for development of free forms. Payment option of JotForm supports eight gateways of the payment including the major gateway of PayPal, Stripe etc. Visual Report Building allowed using the responses of the form. This helps in analyzing the responses of the JotForm. With Jotform, you can collect payment effortlessly via renowned payment modes like PayPal, Stripe, Square, etc. JotForm Price: Free for unlimited forms and up to 100 entries; $9.95/month for unlimited forms and up to 1,000 entries, $19.95+/month after that. Subscription limitation prevents future entry of forms, and the same can be changed only at the end of the calendar month. The website of JotForm is slightly outdated website. As seen clearly, each of the form builders has their own features and pros and cons. Some of the builders are available only as the WordPress plug-in, while others are available as tools for all the users. Moreover, there are certain online form builders that need server space for storing the user’s response while others host their own server. 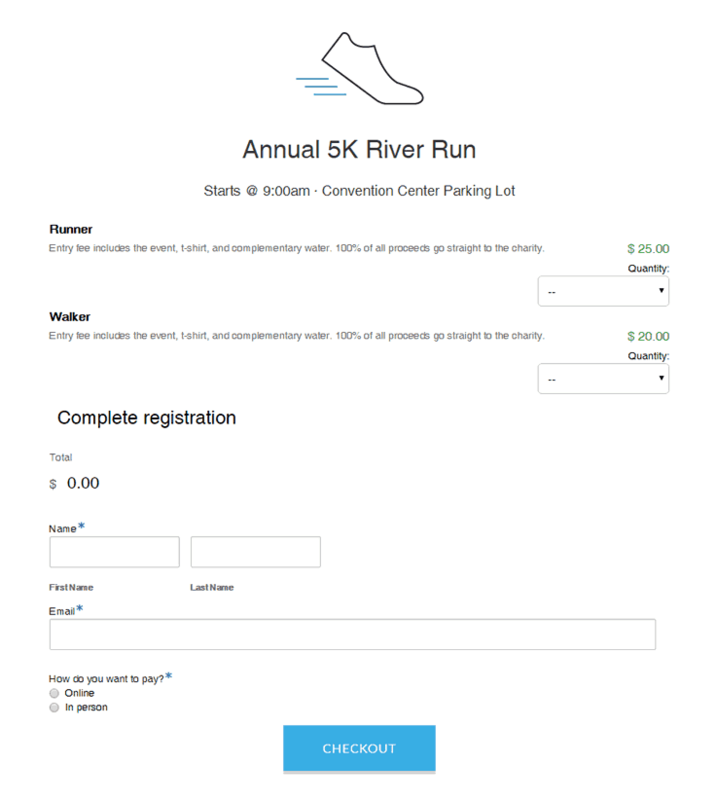 The prices of each of the form builder also vary. I’ve listed all the form builder tools and their features in this blog. Now, it’s on you to choose the one that best suits your business needs and fits in your budget.